Ok – So I have officially gone mad. I have decided that its time to get out there and crank up some miles and one sure fire way to do this is to start as far away as possible and then cycle back. This means I have no real way of shortening the ride, no bailing out, and if you do decide to shorten the distance on a certain day, I only have to make it up the next day. RULE 5 !!! 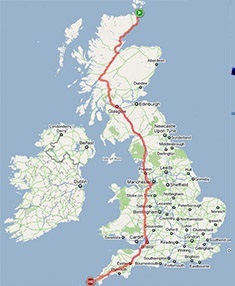 I will now be doing some route planning, where to stay and what to kit out on the bike. This is unknown territory for me. I know I can ride 100+ miles – BUT can I get up and do it 10 days in a row ? – We shall see. Velodromes, Strange Bikes and Fear ! Wednesday was an outing to the Olympic Velodrome in the Queen Elizabeth Olympic Park – London. Woking CC had managed to get a booking, so we get to ride in circles for a few hours. The velodrome is a truly impressive building, even thought it is four years since the Olympics it has not lost any of its 2012 shine. The track is in great condition and the first thing you notice is the gradient of the banking. Now I have been on plenty of “Black Runs” down the side of mountains, but the thought of riding a bike on what seems like a “wall of death” did not seem like a sensible idea. The track bikes are all fixed wheels with “Look” clip in pedals. So you now have the perfect combination for an accident. Feet locked in the pedals, on the equivalent of a “Black Run” to ride on, and a bunch of other people to avoid and make sure you don’t wipe them out. Oh and did I mention – NO BRAKES !!!…. yep you heard that right. My biggest fear was actually not looking like a prat and falling off trying to get the bike started. Hanging onto a hand rail – pulling the bike into action, while hoping you can get the 1st pedal rotation over before the wobble gets too much to fall off. We get out onto the track and the coach pushes up the speed slowly, at the same time moving us further and further up the banking. The first couple of laps were pretty scary ! – The lack of brakes (all controlled with the back resistance through the pedals) as well as the fact you can’t free wheel. I of course completely understood this concept, but my ingrained road cycling brain had not quite made the jump yet, it took three very scary moments when my brain was rudely reminded to keep pedaling as my hip was wrenched from its socket. After fifteen minutes it all started to come together. The faster you go the easier it all becomes. Look ahead and anticipate what the riders ahead are up to and you can ease off the speed before trouble occurs. You always have an option to go up the track if you are gaining too fast and soon we were flinging the bikes up around the curve. We did a few drills and sprints along with some great team riding in groups. If you like riding a road bike this needs to be on your cycling bucket list of things to do. Just resist the urge to relax the feet – KEEP PEDALING !!! If its below 15 degrees …. we don’t need to see the knees.!!! Well for the past 2 weeks we have had a couple of days where the knees have come out to play. Some nice runs out with the Saturday social group and tacking on the extra KMs after the club ride to up the distance. Have also done a few runs over to Windsor Great Park. The traffic free roads are fantastic and the presence of deer and game birds are always a welcome addition to any ride. A few laps of the park in the evening sun were perfect and hopefully a sign of warmer days to come. Breaking news: It looks like “The Project” is now definitely going ahead !! tickets have been booked, money has been paid. It all starts on June the 6th. The next cycling activity is the club trip to the Lee Valley Park Velodrome where hopefully I will be having a go at that strange activity of riding a bike round and round in circles.